4.2 out of 5 based on 207 bloggers and 22 commenters. 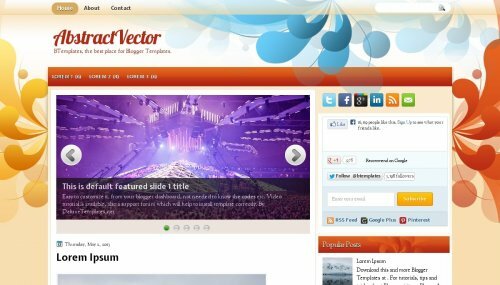 AbstractVector is a free blogger template with 2 columns, right sidebar, footer columns, slider, social bookmarking icons, abstract, gradients and vectorial elements. Excellent template for blogs about art. Where can I paste the other codes? What do you mean by “new HTML gadget”? Why don’t make the background full and not just the heading? Why don’t make full background and not just for the heading? where to add dropdown menu???? Where and how to put drop down menu. Thanks for the clear instructions. Cool! Love this template. I want to upload this template on my blog but blogger is not saving this tempate gvng this error “We were unable to save your template. Content is not allowed in prolog.” plz help me thanks in advance. Please reply this message, I like to use this template to my blog. But the problem it’s reply me the message below. Thanks in advance. Content is not allowed in prolog. How can create my page?